It could be much easier if you focus on your goals and what you expect from one or another web framework (e.g. its performance capabilities, learning curve, development speed, etc.). As a business owner, you probably want to see your project as a profitable and solid player on the market for years and at least get a return on investment. After reading this article, you'll have a solid base of knowledge, with which you can easily decide, which framework is better for your business: Laravel or Rails. We are going to look at both of these frameworks from different corners, leaving every stone unturned. We'll begin with a short introduction, so we can understand the background of Rails and Laravel, learn about fresh trends, review their performance, learning curve, tools, and community. So, let's proceed with our in-depth comparison! Ruby on Rails, or just “Ruby”, is a big invention, provided by David Heinemeier Hansson, who is a quite interesting person. Not only because he invented one of the most popular web frameworks in the world, but he is also a former “24 Hours of Le Mans” car racer. He was one of the first few people that had commissioned the Pagani Zonda HH supercar. However, let's focus on Rails! Ruby on Rails is a web framework that is used to create dynamic websites with a complex structure that will change depending on the user's activity. We are not talking about blogs (however, there are a lot of blogs built on RoR). You are probably already familiar with some websites that build with Ruby on Rails, like Airbnb, Groupon, Hulu, Kickstarter, and Soundcloud. And these websites are just a few big players. 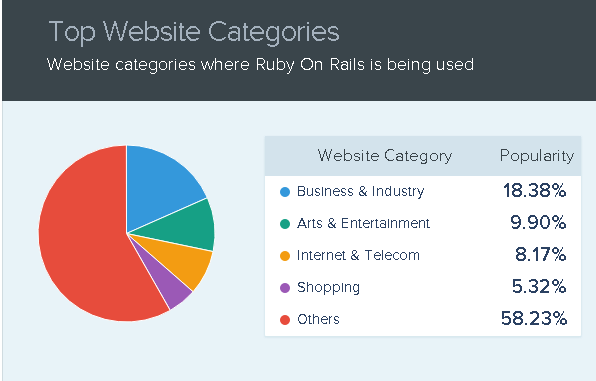 According to datanyze.com, more than 5% of the top 10k websites on the web use Ruby on Rails. Another notable thing about this framework is that it is widely used by young companies and startups. A large share of them was started about 10 years ago, succeed hundreds of millions over the lifetime and now they are big players in their own niche. Let's play a little game, to get the idea of Ruby on Rails. We're going to switch into the physical world! Say you want to make your own ice cream factory. You have a great idea and prescription, you understand your market and how to promote your ice-cream, including connections among retail groups. But, you have no idea how the factory actually works. All these steam machines, blueprints, these pushy engineers are really scary. All you want to do is just to focus on your product and the way you bring it to your users. When it comes to building your factory, the difficulty is that there is no standard template for doing this, because every factory is different. All you need is to get something that will work and meet your requirements. So you start looking for a way to do this, and find a construction company called Ruby & Sons that can deal with your problem. Now imagine that we are talking about the product that comes with a web application. You don't have a time or skills (or both) to care about its background or reinvent the wheel. You are focused on the concept and the way you bring your product to the user, and that's where you're good at. That's why people choosing Ruby on Rails. With it, you can make a workable blueprint, which you can bring to programming team to plug in and make a simple version №1 of your web app. After that, you can easily modify and update your web app in accordance with its concept and performance capabilities. Just like any other web framework, Ruby on Rails comes with its own advantages and disadvantages. Let's take a look at them. MVC philosophy. Due to Model-View-Controller, your application can be extended and new features can be added, no matter if your app is simple or frustratingly complex. If you are looking for a good example of how Ruby on Rails works, take a look at GitHub. This repository of source code is righteously considered to be the largest one in the world, with a complex architecture and tons of different features that work together like a Viennese orchestra. Ruby on Rails is the Chief conductor of that orchestra. Multithreading. It could be tricky, because, despite the fact that Rails supports multiple threading, some of its IO libraries don't, because of the global interpreter lock. In this case, you may face some performance issues, caused by multiple requests over active requests. Well, I guess we've learned enough about Ruby on Rails. So let us look at Laravel for now! Laravel is a PHP web framework. It is a free, open-source framework with which you can build web apps in accordance to MVC pattern (just like Ruby on Rails). Notable features: modular packaging system that comes with a dedicated dependency manager, the variety of ways for accessing relational databases, useful utilities that help in application maintenance and deployment. 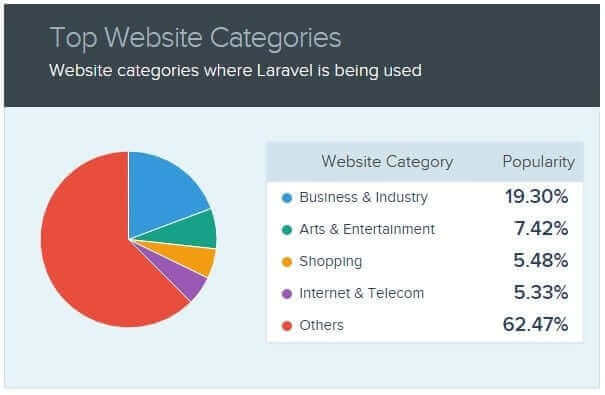 As we can see, Laravel holds 1.94% market share with 10,390 current websites. Certainly, it has a strong position in the market. But why is it so popular? In the past, it was just a promising project, but today it is the leader of PHP-crew. It is open-source, comes with a user-friendly interface, expanded functionality and works with MVC architectural model. One doesn't simply choose a right one PHP framework to develop a web app for your business, because of space of variations of available options. We're going to take a look at the main features of Laravel and where you can implement them for your business. What is Laravel used for? Basically, Laravel comes with a simple and elegant syntax and aimed to take your pain out of development and make common tasks easier (such as sessions, routing, and authentication). The architecture is unique, with which you can create your own structure that is designed exactly for your application. Sites like Startups, Toyota Hall of Fame, WatchSeries, are a good example of how Laravel works. 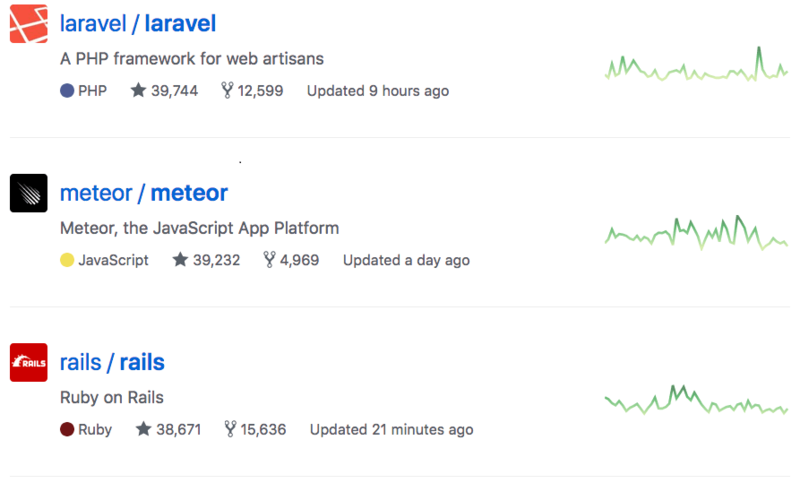 According to Github, Laravel is now the world's most popular web framework! It is a framework where you can do whatever you want. It is easy to learn, create a simple API as well as develop a complex app. Its Eloquent ORM can simplify your work with classes. All you have to do is just to read the code and understand what is going on exactly. Laravel code feels more like a message than a code. For example, you can render a view or use it just as a mail message body. Just like its younger sisters Symfony and Zend, Laravel is composer based. This means that you can use the composer in order to use its components. This PHP framework can help you improve your development. Application logic. Laravel gives a developer its flexibility that they need to create anything that comes in your head: from extremely small sites to enormous enterprise apps. A lack of functionality from the perspective of mobile application development, because of the fact that server acts more like a classic website loader. So, looks like we get the idea of what is Laravel and what is Ruby on Rails. Now we can compare them! Ruby on Rails or Laravel: Which one is better for your project? We know that Rails and Laravel are both good web frameworks, they are widely used all around the world. But where they are used exactly? Keep in mind that Laravel is flexible, comes with tons of features that could work the way you want, but Rails can fulfill your application with richness and unique approach in dozens of different ways. As we can see, Ruby on Rails is widely used in Business & Industry segment. Moreover, not just “widely used”, but twice as much as Arts & Entertainment, not to mention Internet & Telecom, Shopping, and Others. Is that supposed to mean that if your project is related to business or industry - it is the only way of implementation of Ruby on Rails? Of course not! However, it will be easy to find RoR developer who has extensive experience in this area. Ruby on Rails is mostly used in the United States and Russia. Laravel provides you with the most valuable currency called time. With such community and libraries, you can save your time and money and build an operational web application! 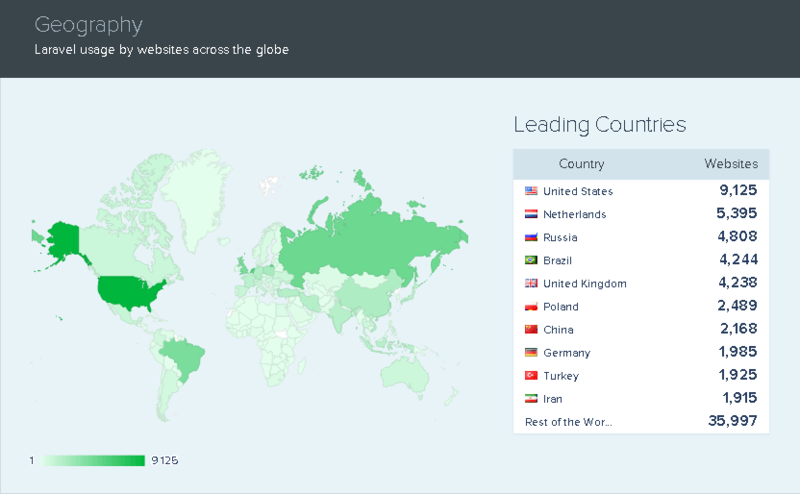 Looks like Laravel is widely used in Business & Industry, and the share is even denser than in case of Ruby on Rails. However, it is pretty popular in other projects as well. 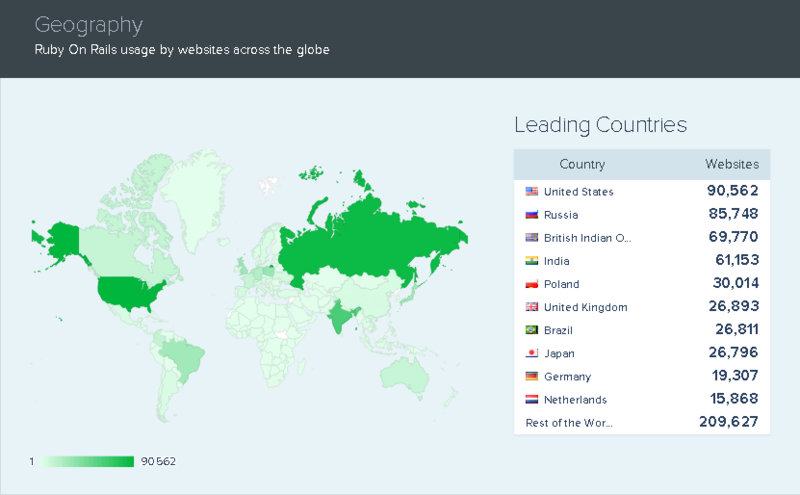 Laravel is commonly used in the United States, Netherlands, and Russia, so if you are looking for a good developer, who works with Laravel, keep in mind these countries. The best way to understand anything is a single glance at the illustrative example! There are a lot of companies using Laravel and Ruby on Rails. However, web applications they get differed in accordance with the needs of these companies. So, let's check them out right now! SolarisBank. Because of a wide range of APIs, users can gain access to its modular services, including e-money, lending, payments, and tons of features provided by third-party providers. This is an example of a masterpiece in terms of the technological banking system for digital companies, fintech, and corporations. Invictawatch com. It is an e-commerce website development startup that is built with Laravel with catalogs, images, videos, and description. Now we can see the picture! But what about open-source projects that are worth drawing attention and represent the capabilities of our frameworks? If you are not familiar with the subject, the open-source project is software, which source code can be inspected, modified and enhanced by anyone. Such projects are really helpful when a developer wants to improve his skill or get the better understanding in case if he wants to learn a new framework. I already mentioned some of the notable open-source projects built with Laravel in the previous article, as well as projects built with Ruby on Rails. If you are interested in this subject, you can learn about these projects by following the links!